Banking has experienced sweeping changes with the introduction of technological innovations. Never before have customers had the luxury to choose how they want to handle their banking transactions. Visiting branches has become rare and optional with much of regular banking needs being wrapped up through the channels of convenient – internet and mobile banking. Recognizing this trend, banks have realized that they must maintain a laser-sharp focus on enhancing the customer experience in such remote transactions. Newly-introduced tech solutions can bring in human interaction even when the bank staff and the customer are far away, geographically. Live chat, co browsing and video chat are some tools that have seen much success in raising the quality of customer service in companies across industries. For banking, they can bring in even more benefits. While customers are increasingly getting comfortable with remote access, nonetheless there are often occasions when they require expert help from banking representatives. After all, finance-related decisions and actions can be daunting for many and that’s why they turn towards banking staff for their help. One of the top areas where virtual interaction can make a difference to customers is transactions that involve tellers. Singaporean bank PSOB, last year installed a video teller machine that provides additional services to customers who can’t visit a bank branch. With such innovative services, banks show they are taking the extra step to deliver customer delight. Not only will it result in happy customers, it will help differentiate from a sea of other competitors. There are a number of solutions available today, but WebRTC-powered platforms are cost effective, easy to use and easy to deploy while providing safety and security with feature like one-way chats. High-Quality Customer Support: Direct conversations are more efficient in identifying the issues and providing solutions. 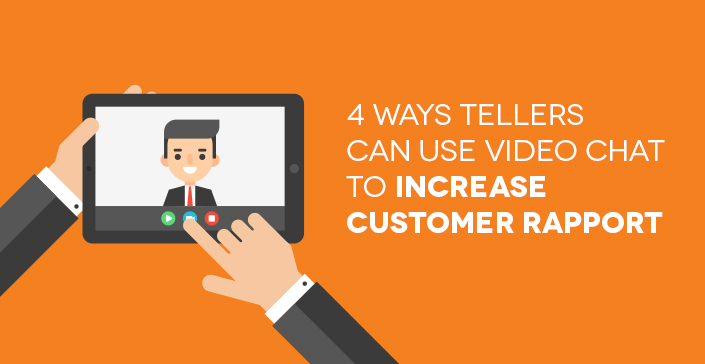 Video-based discussions facilitate easy interaction between the customer and the customer service agent which eliminates the need to visit a branch. Customers can explain their problem and receive live guidance for their issues. Personalized Solutions: With video chats, customers receive personalized support for their issues. Bank staff is able to access all relevant customer details instantly, helping them give a holistic solution most suited for the situation. The live interaction ensures that issues faced by customers are accurately diagnosed and sorted. Non-Verbal Communication: Video chats are unique in enabling the closest experience to an in-person branch visit. The bank customer representative is able to see and understand customer’s body language and proactively respond to it. Human Touch: With video chats, customers experience human interaction even remotely. This ability to see and speak to a live banking representative enhances trust and boosts satisfaction. Customers feel reassured that their needs are being catered to by the bank. As can be seen with the use of video chats, tellers are placing themselves in the best possible position to develop deep customer relationships.